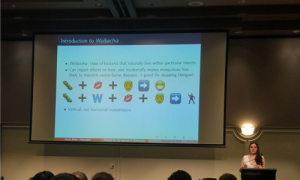 Personally, one of the most memorial talks of the ANZIAM 2018 conference was the first plenary talk by Nick Trefethen. 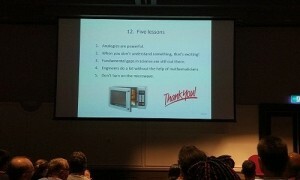 He spoke about the mathematics of the Faraday cage, something everybody has heard of. Surely, many of us have some intuitive idea on how a wire mesh is blocking electric fields and electromagnetic waves. But are our ideas really correct? It turns out that the shielding effect improves only linearly as the wire spacing decreases and that it depends on the wires having finite radius. 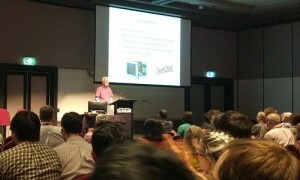 Nick Trefethen gave a very interesting talk about this topic. The audience in the Grand Hall were caught in Nick Trefethen’s talk: the presentation of the Faraday cage phenomenon and also his lesson about analogies, see Figure 1 and 2. 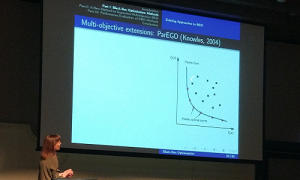 Another presentation that caught my attention was the Wednesday afternoon plenary talk by Kate Smith-Miles. My interest in her talk is founded not only by the intersection with my own research topic but also by the scale of the problem and the way of its presentation. This starts already with the intriguing title: “Optimization in the Darkness of Uncertainty: when you don’t know what you don’t know, and what you do know isn’t much!” The presented optimization problem is a constrained multi-objective problem with no analytical expression for the objective functions. Calculus for analytically solutions cannot be used. Moreover, due to the high expense of evaluating the objective function, we have to limit the number of measuring points. Random trials are too expensive to be a valid option. 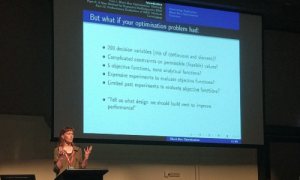 Kate Smith-Miles introduced two strategies for black-box optimization and made the audience aware of the importance of methods for evaluating their performance. Finally, I want to mention an interesting student talk. Sarah Belet was concerned with models for the spread of Wolbachia in mosquito populations. The introduction of the parasitic Wolbachia bacteria into mosquito population is a means of suppressing dengue fever transmission via particular breeds of mosquitoes. I was captivated by the vivid descriptions of this young researcher. 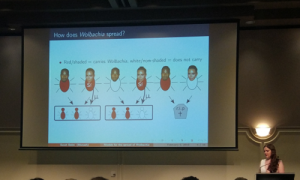 The comprehensible transmittance of the biological background (the phenomenon of cytoplasmic incompatibility) and the mathematical modeling of Wolbachia spreading through mosquito populations made this talk one of the most memorial presentations of this conference. In particular, I was caught by the many joint ventures between different research fields in mathematics, medical studies, and engineer topics. Sarah Belet’s talk is a good example for this.